Communicate clearly in difficult weather. Wherever you work - in howling wind, driving rain, and severe weather - Windporting helps you communicate effectively and listeners hear clearly. The APX™ Series is the mission critical advantage for responders in mission critical environments. Motorola designed the APX P25 radios and remote speaker microphones (RSMs) for the absolute rigors of these situations. Motorola's Mission Critical Wireless Covert Solutions for APX™ and XTS® radios take your surveillance operations to the next level. Consumer grade in appearance but mission critical in performance, their portfolio delivers exceptional flexibility, the high security of Mission Critical Wireless technology, superior audio performance, and a new dimension of freedom from your radio. Motorola's secure wireless solutions let you carry your radio like never before â€“whether in a backpack or purse, you are no longer constrained by wires. Designed for rugged use in noisy environments where hearing protection is required. Motorola offers dual-muff headsets that include a flexible noise-canceling boom microphone with a push-to-talk switch located on the earcup. This can be worn with or without a helmet. Your officers and detectives need wireless accessories that are remarkably fast, secure, robust and easy to use. Yet off-the-shelf Bluetooth products lack the performance, security and comfort they require. That's why Motorola developed enhanced Bluetooth accessory solutions for APX portable radios. 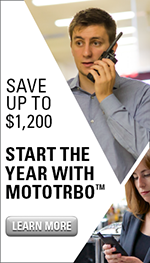 Motorola's portfolio is the choice of first responders in the moments that matter most.